Small intestinal bacterial overgrowth (SIBO) is a pesky issue which means that there’s abnormal numbers of normal bacteria in the gastrointestinal tract. SIBO may cause intestinal symptoms ranging from diarrhoea and weight loss to anaemia and malabsorption. It’s believed to cause/aggravate symptoms of irritable bowel syndrome (IBS)  and some, like Chris Kresser, say it’s closely related to histamine intolerance, so dealing with SIBO may “alleviate” the former . SIBO is diagnosed via lactulose breath testing (LBT), which is fancy speak for drinking a little sugar and then breathing into a tube. As an aside, an interesting study published in Gut, the official journal of the British Society of Gastroenterology, raised the point that people administering this test may not properly trained in its execution nor its interpretation . Many view SIBO eradication as the Holy Grail of histamine intolerance treatment. Kill the overgrowth, heal the gut, return to a normal diet. Sadly, spending months or years on antibiotics and or sugar free diets seems to be the norm. I was lucky. I tested positive, started drinking olive leaf tea, cut most processed sugar out of my diet, but kept fruit in there. Six months later I was tested again and boom, it was gone. Till now I haven’t really had a great reply to folks asking me how I managed to get rid of it. I never really thought much of it at the time because I didn’t really notice that much change in my symptoms afterwards. Or none that I attributed to the SIBO clearing up. Thing is though, and this is one of the biggest “mistakes” I made in my healing: I made too many changes at once, so it was hard to tell what had done what. In this case, around the time I nixed the most commonly prescribed medical treatment; an antibiotic called Rifaximin and made the SIBO diet changes, I also started eating a diet very, very, very high in herbs. People’s eyes would bug out when they saw the volume of greenery going into my soups. Turns out my instincts were right on, because herbs, some common culinary ones and others you might have to make a trip to your local Whole Foods supplement shelf for (under medical supervision of course! 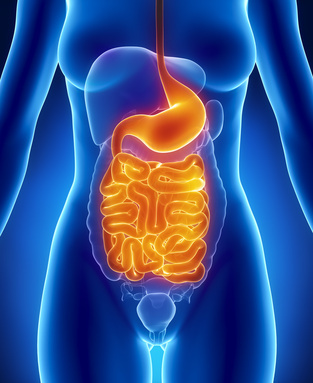 ), have been found to treat SIBO as well as a 10-14 day course of the antibiotic Rifaximin, with significantly fewer side effects; like causing further bacterial imbalance in the body and the very scary super bug Clostridium difficile. I encourage you to print out the study (thanks Adele for bringing it to my attention!) found here for your doctor, specifically TABLE 5 (you’ll have to click on that separately) which shows all the effective herbal remedies. Check out the aforementioned table for the full list.